In writing a review of this excellent new album by British duo 'My Darling Clementine' it is probably a good idea to give a, relatively, brief summation of their careers so far. For the uninitiated the duo consists of husband and wife team Lou Dalgleish and Michael Weston King. In the past Lou worked with artists as diverse as Brian Ferry and the Brodsky Quartet as well as recording four albums of her own and writing and appearing in a play at the Edinbugh fringe festival before she and her husband adopted their 'My darling Clementine' persona. Certainly in the British Isles, Michael was a pioneer of the alt. country sub genre, before it even had a name, as leader of The Good Sons, a band who released four acclaimed albums in their seven year life. A solo career beckoned during which, to date, Michael has released seven studio and three live albums as well as travelling the world with artists such as Nick Cave, Roger McGuinn, Steve Earle, Guy Clark, America, Chris Hillman, Son Volt and quite a few others! 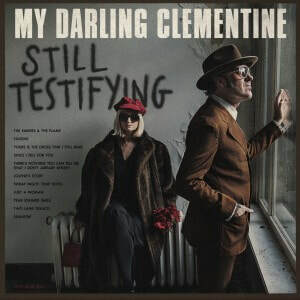 Michael and Lou had been married ten years before releasing their debut album as My Darling Clementine, 'How do you plead' in 2011 and since then there have been three more albums up to and including 'Still testifying' as well as, to my knowledge, two e.ps. This new recording came out in the spring of 2017 but as I missed it then and it is such a good album I worked on the assumption that if it's good enough it's never too late! They may be a country duo, but with a much more expansive sound than that label suggests and with a lovely edgy sound more akin to Gram and Emmylou than some of the more sanitized country duos of the past. Nothing wrong with a little polish I suppose but their tremendous duets, both as songwriters and performers are rooted in reality rather than an idealistic fantasy world, with substance far more important than sheen. I've seen the album described as 'countrypolitan' but the other recordings I've heard described thus have been smooth and often soulless; this excellent album is neither, containing spirit, fire and what I can only describe as a 'grown up attitude.' I'm not too sure exactly what I mean by that, perhaps it is the fact that both are such experienced musicians and know each other so well that there is more than a thread of realism running through their songs, even those that seem to be fictitious. Maybe I'm barking up the wrong tree but there is certainly a much greater depth and a far more distinct edginess to their songs than just about any other 'country duo' I can think of. Chunky guitar gets album opener The embers and the flames underway, with keyboards, brass and thudding bass leading to Michael and Lou's vocals coming in together before they exchange lines, eventually linking up again, feeding off each other's emotions. The steel guitar is there in the background but despite the dense instrumentation the vocals have plenty of space to draw every drop of drama out of an excellent song that perfectly suits a married couple and has beautifully constructed lyrics. Eugene opens with Lou's lovely restrained vocal supported by just piano, bass and keyboards on a beautiful slow moody ballad. After a while Michael comes in on a verse supported by brass with an equally restrained percussion, before an excellent brass break that almost has a New Orleans feel, whilst the couple exchange verses throughout the song. Bass, percussion, guitar and keyboards with organ allied to Michaels excellent heartfelt vocal gets things underway on Yours is the cross I still bear before Lou comes in on another verse assisted by chiming guitar and restrained organ as they interchange verses. Mid way the song lifts and the tempo and dynamic changes, intensifying the sense of drama as the two voices come together. Lou's vocal gets Jolene's story underway with a sympathetic percussion and gentle guitar, then as the song lifts off and the sound deepens Michael comes in on vocals with steel guitar, fiddle and piano adding to the strength and variations in the song before we get a nice melodic twangy short guitar break with the chorus almost having a mix of Tex Mex and countrypolitan! Finally we're treated to the sound of a lovely accordion on Friday night, Tulip hotel, with throbbing bass and clicking percussion supporting the two beautifully blended voices, with a gentle steel guitar and piano also in the mix, adding further depth and variety to the song.